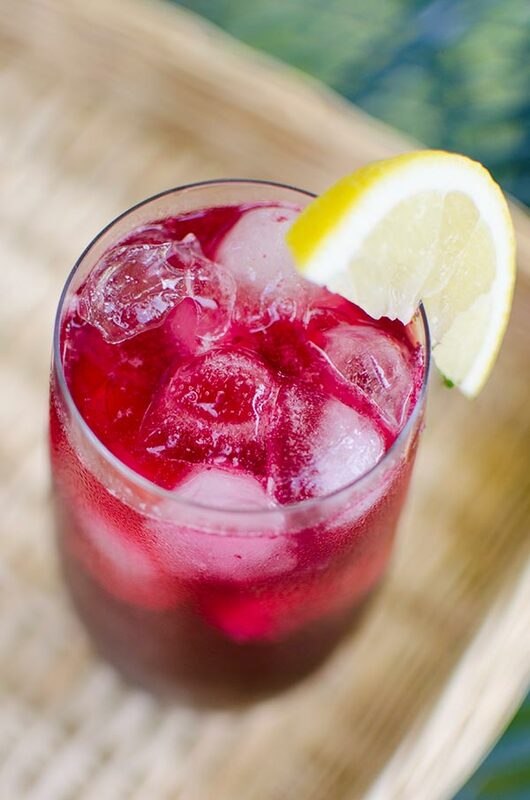 Hot summer afternoons just call for a cold, sweet-tart drink, and this blueberry vodka lemonade hits the spot. I haven’t really posted many cocktails or drink recipes on here, but I think there are some days that just require a good cocktail, don’t you? Especially one that involves vodka, blueberries and lemon. Hello, dreamy summer drink! It’s summer and I think if there’s one thing you should do this week it is to indulge (you deserve it!) in the backyard, on a patio, or just in your living room with the windows open because hello, big-city, balcony-less living is, unfortunately, far too common. I know it’s a Wednesday, but you have something to look forward to this weekend. Or, you can even have this cocktail tonight because after all, it is a Wednesday. And even if you love your job, it is still a Wednesday. I find that once I have a pretty solid routine, the weeks tend to go by quickly and before I know it, the weekend has arrived. Maybe it’s because my days have been pretty nonstop recently, but this summer is just flying by. I feel like I blink and suddenly it’s Thursday and I have a million things to do. When that weekend does hit, I’ve really been enjoying spending time in the backyard, relaxing in the sun with a refreshing, thirst-quenching cocktail (this drink can also easily be made without alcohol) and reading (I’m reading The Light Between Oceans, it’s great so far). 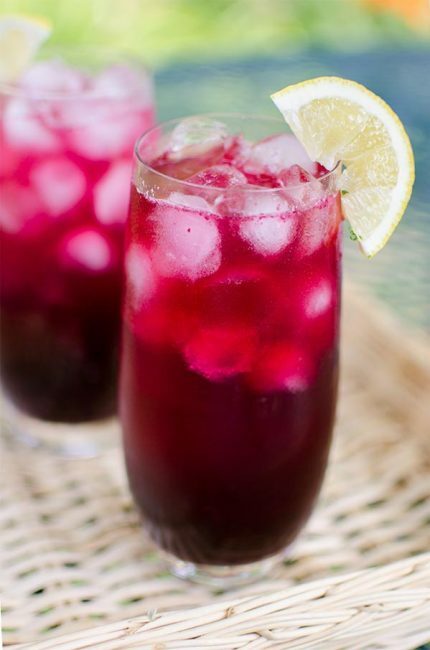 Other than a good book, I think the secret to adding a little bit of je-ne-sais-quoi to your afternoons come in the form of summer refreshments and this blueberry vodka lemonade is one of those special drinks you’ll want to make over and over again. I like to make a batch of the blueberry syrup on a Friday night and keep it in the fridge all weekend. For this recipe, I was inspired by all the delicious blueberries I’ve been eating and this watermelon berry fizz – I liked the idea of berries + fizz and played around with adding watermelon to this cocktail, but decided to go the classic route because we all know blueberries + lemon = match made in heaven. You’ll notice that my blueberry syrup only has 2 tbsp of sugar, that’s because in this recipe I also used the Country Time Lemonade Liquid Drink Mix which is a concentrated lemonade starter which adds sweetness, a hint of sourness and lemon flavour – this syrup would also go really well with pancakes! In a small pot, bring water, blueberries, sugar and lemonade drink mix to a boil. Boil, stirring often for about 10 minutes or until blueberries have broken down. Strain, and set aside to cool. You should have about 1 cup. To assemble drink, pour vodka, lemon juice and blueberry syrup in a glass. Top with ice and soda water. Disclosure: This post was sponsored by KraftHeinz Canada – as always, all opinions are my own. Thank you for supporting my sponsors and allowing me to continue creating recipes like this blueberry vodka lemonade! So REFRESHING - love the blueberries! Thank you Louisa. Thanks, Fiori! Glad you enjoyed it. Perfect blend of tart and sweet and vodka? You know it, best drink for a summer night! This looks so refreshing! This summer I’ve tried many different lemonade recipes, but none with blueberries. Thank you for sharing it! Thank you Linda, let me know if you give it a try! Truly It feels like heaven when I was drinking it in my lawn!!! Thanks lou!! !